So how did we end up snow camping in Bhutan? I always said I would never go snow camping. Never say never.... but me tell you our story. We went on that trip to Bhutan way back in 1978. Bhutan had pretty much been closed to tourists, but it was just opening up. We had a friend who had a friend who had connections in Bhutan. So ten of us got an "invitation from the king". We had all been trekking together in Nepal, but we called ourselves "social trekkers". We were used to soft trekking.... treks that were not too high and not too hard and with Sherpas and porters to carry most everything and laugh at us because we were so soft. They weren't used to that in Bhutan. Our trip was in April. It was spring. The rhododendrons were in bloom. The day we arrived in Thimpu it was beautiful and warm. We explored around the capital for a couple of days. There were so few tourists back then that the dance performance they put on for us drew a huge local crowd. We were going to hike over the pass and down into Paro. We waited until after lunch to begin our trek because we weren't going that far for the first night. Our Bhutanese guides used ponies to carry our gear. We dressed in light pants and t-shirts for hiking in the heat, threw a plastic poncho into a day pack "just in case" and started up the mountain. The only tourists our guides had encountered before had been serious mountain climbers... it soon became obvious, to us anyway, that they didn't quite know how to handle our group of softies. They took off up the mountain with our gear, as the Sherpas and porters would have... to set camp up for us. And one guide stayed with us to lead the way, but as the afternoon wore on, our group of ten became strung out up the mountain. We didn't worry; we could see each other. now because we were all watching our feet trying not to slip. Then the wind began to blow.... this wasn't good. Next thing we knew it was sleet, then hail, then snow.... and it progressed to a full blown blizzard.... in APRIL! OK we SHOULD have stayed together. But we didn't. We all eventually made it up the mountain wading through the snow. So that's how we ended up ALMOST snow camping in Bhutan. The truth is we were going to pitch tents beside a small mountain hut. (You can see the mountain hut--off to the left--in the photo above.) When our guides realized that they had a bunch of softies strung out down the mountain, they decided we would all sleep in the mountain hut. A better decision we couldn't have asked for.... when we straggled into the mountain hut, wet and cold, they had a fire going and a hot cup of tea ready. It was a cozy and magical evening as we dried out and warmed up, added a little cognac to the tea and sang and danced after dinner. We all threw our sleeping bags on the floor around the wood stove and NO ONE said "lets pitch the tents and sleep in the snow." The next morning the sun was out and the mountains were absolutely breathtaking with a new coat of snow. There was too much snow to make it over the pass, so we just hiked around the mountain hut then went back to Thimpu the next day. We drove to Paro. Our guides had decided the only way to keep us together and on their schedule was to put all the softies on horses for the journey up to Tiger's Nest Monastery and beyond. So did I lead you on with the title of "Snow Camping in Bhutan"? Maybe a little. It was close. We're glad we had the mountain hut to sleep in instead of those tents in the snow. 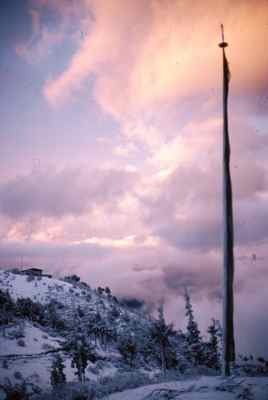 Bhutan in the snow is beautiful, and the memory is even better because we have WARM and fuzzy memories of that night sleeping around the wood stove together in the mountain hut. Hey, I've been to Bhutan, but I never saw it in snow. That's a beautiful picture. Join in and write your own page! It's easy to do. How? Simply click here to return to Invitation 2 Share Your story.